Home Top Mark Solutions News We’re hiring! We’re looking for a talented new addition to our facilities management team. Take a look at our job description below and send us your CV if you are interested on: info@top-marksolutions.co.uk. 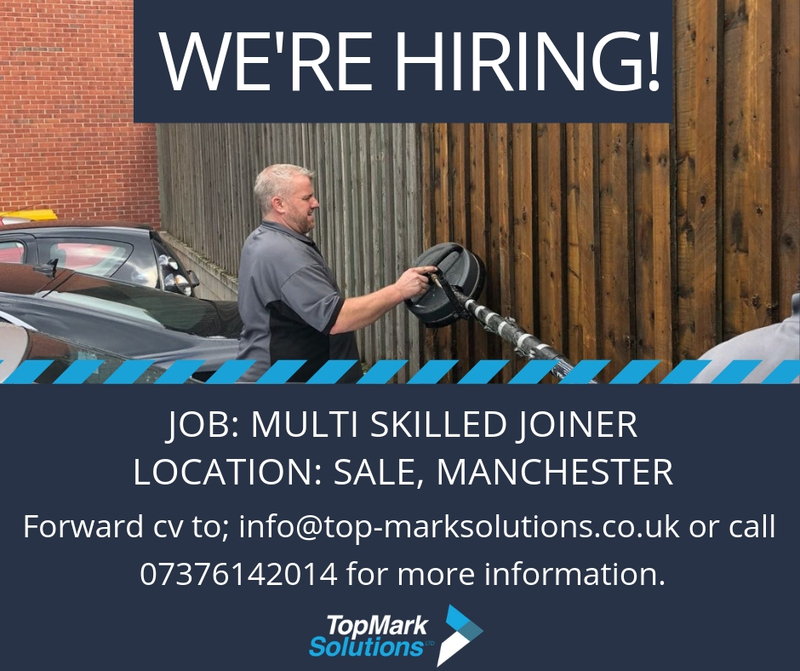 We are a fast-growing facilities management company based in Sale, Manchester who is seeking an experienced multi skilled joiner with relevant experience across a broad spectrum of property maintenance to join the team. Successful candidate will be expected to work independently on jobs and as part of a team. General carpentry / hanging doors / boxing in / fitting windows / boarding windows. Five years checkable references required. Details: This is a full time position with negotiable rates of pay depending on experience. We offer an excellent package including a company vehicle, mobile phone and excellent holiday entitlement. Forward cv to; info@top-marksolutions.co.uk or call 07376142014 for more information.